Titus Lucretius Carus (c. 99 B.C.E. - 55 B.C.E.) was a Roman poet and Epicurean philosopher. During the first century B.C.E. he wrote De Rerum Natura (“On the Nature of Things”), a masterpiece of Latin verse which sets out in careful detail the Epicurean worldview. Beginning with a tribute to Epicurus, the six books of De Rerum Natura provide a full explanation of the physical origin, structure and destiny of the universe. The work includes theories of atomic structure and of the evolution of life forms. The work is intended to free the reader from the two types of mental anguish that Epicurus identified as obstacles to human happiness: fear of the gods and fear of death. Lucretius does this by expounding the philosophical system of Epicurus, clothed, as he says, in sweet verse to make it more palatable. De Rerum Natura was an important influence on Virgil and later Roman poets. The early Christians frowned on De Rerum Natura because it denied both the afterlife and divine intervention in human affairs, but during the Renaissance the work emerged as a source of inspiration for numerous scholars, scientists and philosophers. It is also a valuable source for understanding the details of the Epicurean philosophical system, since many of the written works of the early Epicureans no longer exist except as fragments. Very little is known about Lucretius' life; the information we have comes from occasional references to him in the works of later writers, and from what can be understood from his writings about his character, attitude and experiences. Jerome, in the Chronica Eusebia, mentions Lucretius and says that he died at the age of 44. Aelius Donatus, in his Life of Virgil, while stating that Virgil assumed the toga virilis on October 15, 55 B.C.E., adds, "…it happened on that very day Lucretius the poet died." If these two sources are accurate, Lucretius would have been born in 99 B.C.E. Cicero (106-43 B.C.E.) implies in one of his letters to his brother that they had once read Lucretius' poem. From his name, Lucretius, it is generally assumed that the poet was associated with the aristocratic clan of the Lucretii, either a family member or a freedman or slave attached to that family. As a poet and an educated intellectual it is clear that Lucretius came from a privileged background. 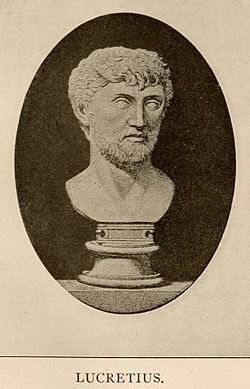 The only certain facts of Lucretius' life are that he was either a friend or a client of Gaius Memmius, to whom he dedicated De Rerum Natura, and that he died before the poem was finished (Gaius Memmius was a Roman patrician who was at one time married to Sulla's daughter, Fausta. He was involved in a political scandal in 54 B.C.E. and exiled to Athens in 52 B.C.E.). According to literary tradition, Lucretius had a wife, Lucilla, but there is no evidence, except for a brief mention in his poem of marital discord and a reference to "our Roman wives" (4.1277), that he was ever married. It is clear from his poem, De Rerum Natura, that Lucretius was a serious student of science and philosophy and a keen observer of natural phenomena. The poem is full of images and descriptions of plants, animals and landscapes that reveal a sensitivity to the beauty of nature and the change of the seasons. Like Epicurus himself, Lucretius obviously preferred to distance himself from political strife and live surrounded by nature. A fourth century chronicle history by Jerome contains the following item regarding the death of Lucretius: 94 [sic] B.C.E. "The poet Titus Lucretius is born. He was later driven mad by a love philtre and, having composed between bouts of insanity several books (which Cicero afterward corrected), committed suicide at the age of 44." Scholars discredit this story for several reasons. De Rerum Natura contains a two-hundred-line denunciation of sexual love; it seems improbable that a person so aligned with Epicurean principles of moderation and self-control would have fallen victim to a love potion. It is also unlikely that someone suffering from mental illness would have been able to produce such a lucid and sophisticated work of poetry. Finally, Jerome and the early Christians were motivated to discredit Epicureans as being atheists; it is thought that their works may even have been deliberately destroyed by the early Christian church. The first century B.C.E. was a time of political turmoil and violence which threatened the stability of the Roman Empire. The Social War (91-88 B.C.E.) between Rome and its Italian allies was followed by a Civil War instigated by Lucius Cornelius Sulla. Sulla became dictator in 82 B.C.E. and executed more than four thousand Roman citizens. In 71 B.C.E. the slave revolt led by Spartacus resulted in the crucifixion of six thousand rebels. Catiline was defeated and killed in 62 B.C.E. Roman intellectuals were stimulated to seek solutions to the disparity between ideal concepts of government and the reality of corruption, violence and injustice. This brought about a resurgence of interest in Epicureanism and in stoicism. The two most authoritative manuscripts of De Rerum Natura are the O and Q codices in Leiden, both dating from the ninth century. Scholars have recently deciphered a manuscript on papyrus scrolls, possibly dating to the first century C.E., which was recovered from a library in Herculaneum that had been buried by a volcanic eruption. All other existing manuscripts date from the fifteenth and sixteenth centuries and are based on a manuscript (now lost) discovered in a monastery in 1417 by Poggio Bracciolini, an Italian humanist. De Rerum Natura has been a continuing influence on the work of a number of epic poets, including Virgil, John Milton, Walt Whitman and William Wordsworth. The sustained energy of Lucretius' writing is unparalleled in Latin literature, with the possible exception of parts of Tacitus's Annals, or perhaps Books II and IV of the Aeneid. His use of the hexameter is very individualistic and ruggedly distinct from the smooth urbanity of Virgil or Ovid. His use of heterodynes, assonance, and oddly syncopated Latin forms create a harsh acoustic. Lucretius laments several times that Latin is not as well suited as Greek for the expression of philosophical ideas. De Rerum Natura is organized into six books, designed to sketch out a complex philosophical argument in such a way as to make it understandable and logically compelling. Lucretius compares his work as a poet to that of a doctor. Just as a doctor may put honey on the rim of a cup containing bitter but healing medicine, Lucretius cloaks hard philosophical truths in sweet verse to make them go down more easily. At the same time, he is careful not to let his literary devices overshadow the philosophical truths he is seeking to convey. Book 1 begins with an invocation to Venus. Lucretius identifies Venus with love, the unifying force of Empedocles, and also as the patron and mother of the Roman people. He then sets forth the major principles of Epicurean cosmology and physics: atomism, infinity of the universe, and the division of existence into matter and void. Book 2 celebrates philosophy as a sanctuary from the turmoil of the world, contains an explanation of atomic motion and shapes, and explains that atoms do not have secondary attributes such as color and smell. Book 4 contains verses on the art of didactic poetry and an explanation of Epicurus' theory of vision and sensation. The conclusion is one of Lucretius' greatest passages of verse, analyzing the biology and psychology of sexual love. Book 5 is devoted to Epicurean cosmology and sociology. Lucretius talks about the stages of life on earth, and the origin and development of civilization. This book includes a famous evolutionary theory on the development and extinction of life forms. Book 6 contains some of Lucretius' greatest poetry. Lucretius explains meteorological and geologic phenomena and includes vivid descriptions of thunderstorms, lightning, and volcanic eruptions. The poem ends with the story of the great plague of Athens (430 B.C.E. ), and is obviously unfinished. Lucretius makes it clear that he intends his work to be an exposition of the philosophy of Epicurus. He is credited with clarifying and giving substance and depth to the original worldview suggested by Epicurus. Most of the original works of the early Epicureans were lost, and with them, many details of their cosmology. The remaining fragments of their work only offer clues to their thought, but De Rerum Natura lays out a profound explanation of the ideas of Epicurus and offers proofs and examples from the natural world. Lucretius is responsible for preserving and transmitting Epicureanism as a viable system of thought. The ideas on evolution advanced in the last book were a unique contribution of his own. In his poem, Lucretius avoids supernatural explanations of natural phenomena and seeks instead to discover scientific laws and processes. In some instances, his adherence to certain Epicurean principles, such as the validity of our sensory perceptions, leads him to some unrealistic conclusions, such as that the moon is actually a small disk exactly the size that it appears to be to the naked eye. By the end of the first century C.E., De Rerum Natura was rarely read and Lucretius was almost unknown. The recovery of his lost manuscript during the fifteenth century provided a stimulus to the Renaissance scientists and philosophers of the sixteenth and seventeenth centuries. The Greek concept of atomism and the idea of the universe as an integrated whole contributed to the development of modern scientific theory. Lucretius’ influence on early modern philosophy can be seen in the work of Pierre Gassendi (1592-1655). Bergson, Henri. The Philosophy of Poetry: the Gernius of Lucretius. Philosophical Library, 1959. Latham, R. E. (trans.) and John Godwin (introduction and notes). On the Nature of Things. Penguin revised edition, 1994. Lucretius. 1971. De Rerum Natura Book III. Cambridge University Press. Corrected reprint, 1984. Sedley, David N. Lucretius and the Transformation of Greek Wisdom. Cambridge University Press. New edition, 2003. West, David Alexander. The Imagery and Poetry of Lucretius. University of Oklahoma Press, 1994.